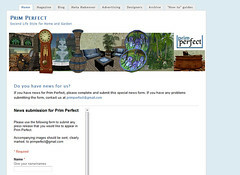 Do you have Summer News for Prim Perfect? To appear in our next edition, we must receive your news story by 1 am SLT, Wednesday, 8th August, 2012. Previous Post: Celebrate London 2012 and the Olympics in Second Life! Next Post: Are you the Prim Perfect winner?